Will Caterpillar Raise Its Dividend in 2017? The heavy-equipment manufacturer has seen its stock soar, but its business is still struggling. Will a dividend increase come soon? Dow component Caterpillar (NYSE:CAT) saw its stock bounce sharply higher in 2016, rewarding investors who had stuck with the heavy-equipment manufacturer through the toughest times for its business. Better conditions in the energy and commodities industries have investors believing that Caterpillar could start seeing orders come from customers in those sectors, and a new push for greater spending on construction and infrastructure projects could have a positive influence on Caterpillar, as well. Yet what dividend investors most want to know is whether the company will hike its payout this year, especially after a longer-than-normal period of keeping its quarterly payments flat. Let's take a closer look at Caterpillar to see whether it will raise its dividend in 2017. Caterpillar has done everything it can to keep up its long history of dividend growth, despite the huge downturn that the company's business has undergone in recent years. For more than 10 years, large dividend increases were the norm for Caterpillar, with annual boosts of 10% or more being commonplace, except in times of extreme financial stress. Yet in 2016, Caterpillar turned to a tactic that it had used before during the financial crisis of 2008 and 2009. Because Caterpillar typically boosts its dividend in the middle of the year, it can claim annual dividend growth even if it goes an entire calendar year without making an increase to its quarterly payout. For example, in 2015, the heavy-equipment maker raised its dividend from $0.70 to $0.77 per share, and for the calendar year, Caterpillar paid a total of $2.94 per share in dividends -- two smaller payments earlier in the year and two larger ones at the end. In 2016, it sustained that $0.77 amount for four quarters, paying a total of $3.08 per share. That way, Caterpillar extended its streak of paying higher amounts of dividends annually -- even though it didn't make its typical mid-year move last year to increase its quarterly amount. CAT Dividend data by YCharts. Note: 2012 spike reflects acceleration of dividend into December rather than making its usual January 2013 payout. Some investors are even worried about whether Caterpillar can truly afford to sustain its current dividend, let alone do future increases. Over the past 12 months, Caterpillar's earnings have amounted to just $1.03 per share, which is only a third of what it's paying to investors. Admittedly, Caterpillar has ample cash flow to cover dividend payments. Yet even Caterpillar's own management team has thrown cold water on increasingly optimistic views from its investors, cutting the company's near-term guidance on concerns about global economic weakness, and even making some bullish investors wonder whether the company will be able to push its dividend higher in 2017. 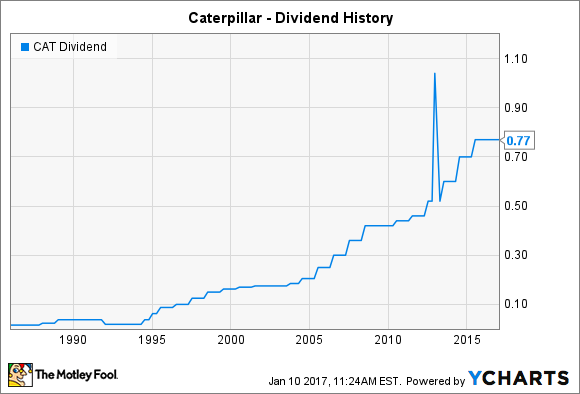 When should investors expect a Caterpillar dividend increase? Moreover, Caterpillar has stressed the importance of its dividend, albeit in the context of its overall financial planning. During the summer, one finance executive said that "maintaining our credit rating and the dividend are very high priorities for us." Later in the year, in answering a question at a quarterly conference call about a potential impairment charge related to its acquisition of Bucyrus, a Caterpillar executive answered that he couldn't imagine how such a charge would impact the dividend. Having used its free year to take a break from paying higher dividends, Caterpillar will most likely do a mid-year boost to keep its dividend growth streak alive. With just a couple of years remaining before the heavy-equipment giant would be eligible to join the prestigious Dividend Aristocrats list of companies with 25 years or more of annual increases, Caterpillar won't want to do anything to mar its image of stability and success over the long haul.